I have dozens of health care stories started – and lots of photos, but Lymphedema developed lesions in one leg and infected again. Its taking a long time to heal, and I can tell you that pain – the heavy duty stuff – is a life changer. We’re looking at real life MRSA stuff. Have I talked about MRSA yet? Soon, then. 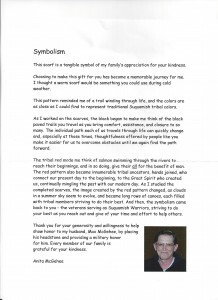 The following story is relevant because it touched me with the dedication of the Suquamish Warriors attention to honor and duty and their sense of right for veterans and comrades – and themselves. They don’t advertise their activities…a person has to know someone to find out what they’re doing. 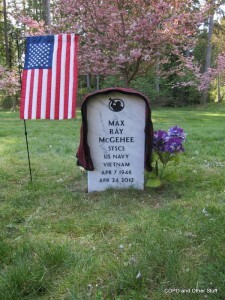 Recently, Mountain View Cemetery in Central Kitsap was the final scene of the Suquamish Warriors two-year wait for a fallen warrior’s headstone. 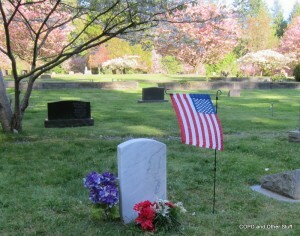 Nine Suquamish Warriors solemnly marched in line to the side of the grave of the warrior and his newly placed headstone and the Bugler’s haunting echo of Taps rippled over the quiet cemetery following the Honor Squad Leaders clipped orders – Ready! Aim! Fire! The seven rifle carrying Warriors slowly raised their M4 rifles and shot as one twenty-one times. With each shot fired the circle slowly closed for the loved ones and friends of Max McGehee, a fallen Suquamish Warrior. Each of the Nine Suquamish Warriors Honor Guard was presented with a beautiful hand knitted red and black neck scarf by Anita McGehee. Her beautifully written Symbolism letter is printed here entirely.